FORT JOHNSON — A new Chevy provided by Mangino Chevrolet of Amsterdam will be available to the golfer who hits a hole-in-one at the St. Mary’s Healthcare Memorial Golf Classic set for Sept. 6 at Rolling Hills Country Club. 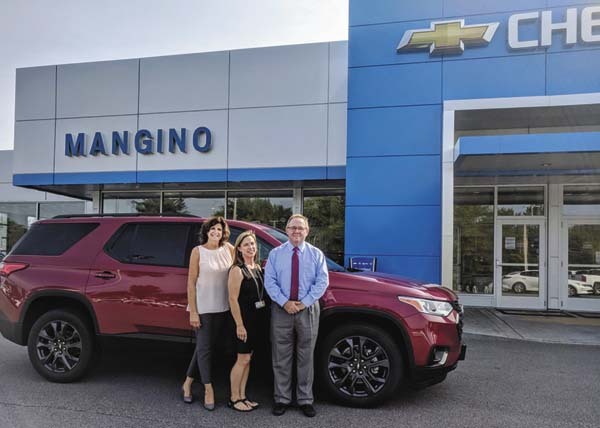 Mangino Chevrolet provides several hole-in-one prizes ranging from the car, to shopping sprees and golf clubs, as part of its support for the tournament. Funds that sponsors and players raise will be distributed by the foundation to help St. Mary’s continue to care to patients all over the region, especially those who are poor and underserved. Golfers at the annual tournament will be treated to breakfast, lunch, snacks, hors d’oeuvres and dinner, as well as beverages on the course and during an after-golf shrimp bar and dinner. Several awards will be given for individual contests and top teams, and each golfer will receive a souvenir. Additional sponsors and players are always welcome. For more information on the St. Mary’s Memorial Golf Classic, or to join the event as a sponsor or player, visit the St. Mary’s Healthcare website’s golf page www.smha.org.